Do you want to share larger files including Movies, Music, Pictures, Office Files etc between your Windows Phone and other device? Do you want to connect your Windows Phone to your PC without any cable or taking out memory card? 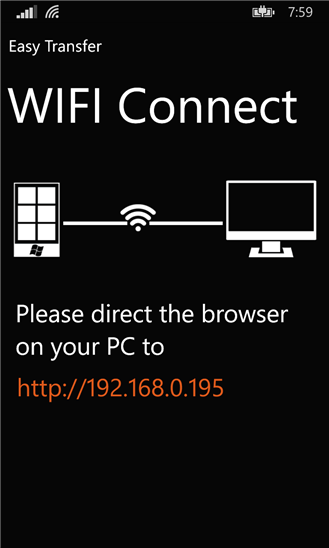 Here is the trick and the solution where the WiFi Direct feature is employed using a free Windows Phone app. This time i am sharing details about a WP app called "Easy Transfer". It is a wonderful app using which you can share between WP-WP or WP-Android or Android-WP or WP-PC at a super fast speed upto 5 Mbps. Note:- For it to work, u need to have this app only on your phone and not on the other phone or PC. 2) Next turn on internet sharing on your phone. To ON internet sharing, you may need to turn on mobile data for few seconds. So don't worry, just turn it for few seconds until internet sharing is enabled. Then you can turn off mobile data leaving internet sharing still on. 3) Connect the other phone/pc to your phone using WiFi i.e internet sharing. Note:- You need not be connected to internet for pairing through WiFi. But you may need to enter password. 4) Open the Easy Transfer app. You will get a web address. That's it. Any doubt/trouble, feel free to ask in comments below. Don't forget to share. It may help other Windows Phone users. What’s New in Windows 8.1 Update 1 or Windows 8.1 Spring Update?